This collection, recorded by Michael Church, is a riveting journey. 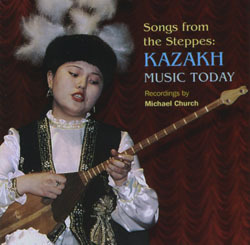 Songs From The Steppes reflects the vigour of Kazakhstan’s present day bardic-tradition, the versatility of its horsehair fiddlers and the new magic which young musicians are creating with ancient instruments like the jew’s harp and zither. It reveals the richness of Kazakhstan’s vocal music: each singer has their own style and sound, and all project as though they are calling out across the steppes.